Former Secretary of Defense Chuck Hagel recently addressed the World Affairs Council of Charlotte, after the election results were certain but before the new administration is installed. Secretary Hagel’s global insights and perspective on changing alliances suggest that a post-WWII new world order is emerging. Here are some interesting points he raised. I believe what we’re seeing in our country, is a reflection of a new post-World War II order being built in the world today. The world order that was built after World War II has lasted about 70 years. In the scope of history, world orders that last 70 years are rather unique, especially in a world where the demographic has shifted in an unprecedented way. Seven billion people exist today, and that number is increasing every day. Demographers tell us we are hitting nine billion by 2050 by the data. “A new world order is being built, is being defined, today. It is a different kind of dynamic today than what it was in 1946 for many reasons. Significantly, there was only one economy in the world of 1946 that was left standing; it was the U.S. economy. There was no other economy left with its own military force. That gave the United States a tremendous amount of leadership capacity, confidence and ability to—along with allies—build this new world order. “These great men and women had such vision after World War II, they did something that had never been done before in the history of man. They built coalitions of common interests: the United Nations, World Trade Organization, international development banks and institutions, IMF, World Bank, NATO, and dozens of other alliance-painted coalitions. They built those coalitions around and predicated on the common interest of most nations. “Those coalitions have served the world very well for 70 years. They’re imperfect—can’t solve everything—but think for a moment if the world had not had these institutions over the last 70 years. Does anyone really think the world would be safer and more stable and better? I don’t think so. I don’t think so. “As we are seeing this new world order evolve, develop, we are seeing a natural questioning of the effectiveness of existing alliances. Challenged alliances because of trade, which now connects us into the political world—because you can’t disconnect the political world from the reality of economics, of security, of environment, the big issues. The political world is the vehicle, the highway in nations, in particular democracies, to arrive at some destination as the decision-makers. 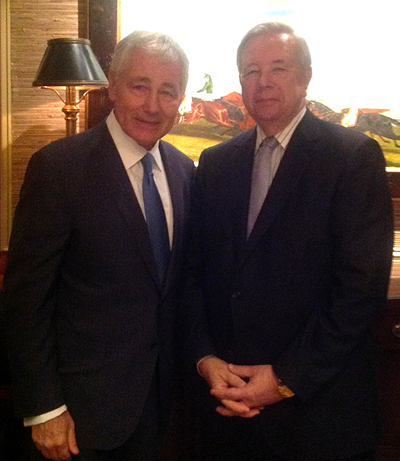 Secretary Hagel provided a first-hand perspective from his experience at the Defense Department as a Republican working for a Democratic President. He expressed concern about President Obama’s lack of commitment to his “drawing a red-line in Syria,” relating quite an interesting story about what happened, and expounded upon the global consequences from that lack of action. He was genuinely concerned that Obama’s lack of action opened the door for Vladimir Putin and Russia to side with President Assad in Syria. That gave Putin the opportunity to lead the way in Syria and to extinguishing the opposition forces to Assad inside Syria. Secretary Hagel was demonstrably upset with the lack of action taken by the United States. It was following that action that he stepped down from the Pentagon. Secretary Hagel finished his remarks by saying, “It’s going to be a balance. New partnerships, stronger enhanced relationships, alliances and trade. I mean, we couldn’t back away from trade if we wanted to. We are so connected to the world in every way and trade is not a guarantee. Never has been. Trade is an opportunity. “Trade does so much more than just exchange goods and commerce. It opens doors that allow nations to respond to each other, understand each other, communicate with each other, connect with each other, coordinate with each other in ways that nothing else can. It opens everything up. It can’t do everything—you need all the other pieces of government as well—but those are fundamentals. Alliances and trade. Former Defense Secretary Chuck Hagel’s remarks at the World Affairs Council in December 2016 are included below, edited for brevity. A new world order is being built, is being defined, today. It is a different kind of dynamic today than what it was in 1946 for many reasons. Significantly, there was only one economy in the world of 1946 that was left standing; it was the U.S. economy. There was no other economy left with its own military force. That gave the United States a tremendous amount of leadership capacity, confidence and ability to—along with allies—build this new world order. These great men and women had such vision after World War II, they did something that had never been done before in the history of man. They built coalitions of common interests: The United Nations, World Trade Organization, international development banks and institutions, IMF, World Bank, NATO, and dozens of other alliance-painted coalitions. They built those coalitions around and predicated on the common interest of most nations. Europe had just been through two tremendously destructive world wars in the first half of the 20th century. We were going to avert that. We were going to have to do something radically different. Therefore, these coalitions of common interests were made. Those coalitions have served the world very well for 70 years. They’re imperfect—can’t solve everything—but think for a moment if the world had not had these institutions over the last 70 years. Does anyone really think the world would be safer and more stable and better? I don’t think so. I don’t think so. As we are seeing this new world order evolve, develop, we are seeing a natural questioning of the effectiveness of existing alliances. Challenged alliances because of trade, which now connects us into the political world—because you can’t disconnect the political world from the reality of economics, of security, of environment, the big issues. The political world is the vehicle, the highway in nations, in particular democracies, to arrive at some destination as the decision-makers. Now, when you see those kinds of numbers, consistently crossing all socioeconomic lines, something’s going to happen. As the historians will reflect on this time and there will be a lot of books written, a lot of analysis will go on for years. What happened in the United States? It was only a manifestation of the realities of this disconnect, this distrust, this confusion, this concern about not just the direction of our country, but the institutions that have a responsibility of keeping the society together. Like any of us in our own lives, we are disrupted by what happens around us. Disruption affects our trust. If you lose trust in personal relationships, business relationships, there is no currency. It’s pretty hard to ever get it back. We have lost a lot of that currency, not just here in the United States, but around the world. Look at what’s happening in every democracy in the country today starting with what happened in the UK a few months ago with Brexit. The presidential election in France is coming up. Elections in Germany, Italy. Half of the countries in Europe are having either presidential or parliamentary elections within the next six months. Some of them are already underway. Like the United States, it is the same feeling about their governments, about their leaders, about their politics. I don’t think it’s all just a breakdown in leadership but the reality is in politics, and again in especially democracies, the politics always reflects the will of the people. Politics never leads. Those of us who have had the privilege of serving in office, being elected, know that quite well. You respond to the needs, the will of the people. I suspect other elections that will take place will not be too dissimilar from what happened here in the recent election. Look what happened in the UK and it is in the process of continuing a political realignment. Where all this goes, I don’t know, but it’s clear to me that in our recent election in America was a political realignment. They tell me that there’s nothing you can do to stop it. It’s like a bad storm. You do two things in a bad storm whether it’s a tornado or a hurricane, whatever the storm. You head for the potato cellar and get out of the way first. Second, you try to think through and plan for what happens a day after the storm blows through and how you rebuild. That’s kind of where we are I think in our country and in the world today. As we move forward a new government is being formed now in Russia. A new government was formed the last few months in Great Britain. We know there will be new governments being formed in France, Italy, maybe Germany, and even in Austria, and Hungary. We will see how those governments will address the people and how well governments and political leaders in society will adapt and adjust to the realities of the world that we live in today. We’re playing catch-up here. It’s like regulation in government. The markets are always ahead of regulation. You can only do so much in the way of regulation. You must depend not on government regulation for honesty, for decency, you’ve got to depend on the people. After all, it is about people. No institution is ever better than its people—every institution is only as good as its people, as its leaders. No better, no worse. Now, this is all swirling around in our country, and all of this causes shift and change and fragmentation of our political philosophies. Really, when you look at the two major parties in this country, what is the legitimate question? What is the governing philosophy of the Republican Party today and the governing philosophy of the Democratic Party today? I would submit that there’s very little governing philosophy in either party today. To add further evidence, the plurality of registered voters in the United States today are independents. Not Republicans, not Democrats. Every year that increases. We are seeing now is not necessarily an abandonment of political parties, but again a disconnect from political parties because of lack of confidence and trust and all the other things that I’ve talked about. Now within this boiling cauldron of uncertainty, yes, there is much danger, but I think too a great opportunity because great realignments must occur in the world to respond to these realities and these challenges of our time. Change is not new. We all know that. Every generation in the history of man has had change. The defining moment of change or challenge is how each generation responds. So far, over our almost 250-year history in the Unites States, we’ve done pretty well. We’ve done pretty well I think for many reasons. First of all, we are a nation of laws, but we also have a system that allows us to self-correct. Now democracies have that, but we can self-correct without guillotining each other, without revolutions erupting. We have mechanics, mechanisms, processes to fix the problem and if the alignments need to be shifted, we can fix those alignments and make them relevant to the challenges of our day. The United States does it better than anyone. That doesn’t mean we’re any smarter. Doesn’t mean we’re any better or mean we are God’s chosen few. While we’ve got this great capacity to self-correct, that’s what’s happening. Let me shift a little bit to more current global challenges, to not just the United States but the world, because we are not an island. As we all know there has been a considerable amount of conversation during the election about essentially pulling back and lessening our commitments to NATO, to other alliances, trade issues. I’m not concerned about the challenging of those relationships in the sense that I think relationships should be challenged. Are they working? Are they relevant? Are they good for all the parties involved? Businesses have to do that every day or you’re not going to be in business anymore. You’ve got to review your product. You’ve got to review every element of your business. Your life, your personal lives. If you’re getting a little bit out of line somewhere, people aren’t buying your product, whatever the signs are, you’re going to have to adjust. You’re going to have to do some things differently. That doesn’t mean you throw away your product. That doesn’t mean you throw away your relationship or you disband the alliance. There’s always a threat of that, of course, in these big global issues. We need to probe a challenge. We need to question. I was a kid once in the Florida Senate and I was questioning a policy in Iraq and someone said that I was disloyal, and I even had someone call me a traitor. I said on the Florida Senate, “It’s not unpatriotic to question your government. It is unpatriotic not to question your government’s policies.” I further explained in elected office I, like all elected officials in Congress, took an oath of office to a constitution, not to a president, not to a political party. I think that needs to be realigned as well because we have become too brutally partisan. Both parties are to blame on this I think in too many ways. They have become captive to special interests. I remember all the special interests that we—all almost all of us—were representing. It’s the larger purpose. It’s the larger responsibility than your special interests. If we are to lose that then we will lose our magic. We will lose our self-direction. We will lose our country. There’s a lot riding here on how all of this plays out and I think we’re in for a bumpy road the next few years as we work through this alignment. It’s not going to be easy because the issues today are so complicated—whether it’s Syria, whether it’s the Middle East, whether it’s North Africa, whether it’s North Korea—because each of these issues is part of this bubbling toxic brew that connects so many pieces now to everything. For example, ISIS. A lot of different views on ISIS. What do we do about ISIS? Well I have taken the view over the years, whether it’s ISIS, Syria, Iraq, terrorism wherever, that the military of the United States or anyone’s military is not going to fix that problem. Because what we haven’t done very well over the years is try to figure out how did this all happen? What produced ISIS? What produces Al-Qaeda? What produced this fundamentalism? It just didn’t appear. Something happened. Something deep down in society and I think there’s where it starts to become complicated because ISIS, the Middle East in particular, Sunnis, Shias, Kurds, Persians—all of that not unlike how Catholics and Protestants killed each other for 30 years in the 30 Years War in Europe—all of that has been produced by centuries of cultural differences, religious differences, ethnic tribal differences. I think we’re still seeing a very disastrous hangover from when the British and the French divided up the Middle East in 1923 and they invented countries that shouldn’t have been invented. They cut across lines of tribal and ethnic areas. The Kurds being a good example. The Kurds are in five countries on those corners. Kurds have never had their own country. I remember meeting with President Erdogan a number of times. The Secretary of Defense, in fact Joe Biden and I were the first to meet Erdogan when his party just developed, just stepped into power in November of 2002. 2002. Biden and I were in the Middle East for 10 days to visit all the countries. We were talking with Erdogan then which you all know could hold no public office because he was not a member of Parliament. He was a leader of the party. We spent two hours with him and then Biden and I drove into Kurdistan that night, an eight hour drive to speak with the Kurdistan Parliament. This was December 2002 and then we invaded Iraq in March of 2003. It was an interesting drive. Senator, Vice President Biden is a good friend. That was an interesting experience being locked into an SUV with Joe Biden for eight hours. Some of our staff people said by the time we reached Erbil the Kurdish driver spoke flawless English. Point being with Erdogan—just to give you an idea of the complications—here is Turkey, as probably an indispensable member of NATO as any country since 1952. My point in telling you this story about when I first met Erdogan, I’ve known him for years and had a very good relationship with him. Last time I saw him, when I was Secretary of Defense, we had a long conversation about trying to get the Turks to allow us, the Unites States, and some of our NATO allies to use the NATO base there in Turkey for short range and into Syria both pilot and pilotless aircraft. Now let me stop there. I think you get my point. Here’s a country, Turkey, that has been as close to the United States and as reliable NATO partner as we’ve had. It’s important because before the implosion of the Soviet Union there was only one NATO country that lived right on the border of the Soviet Union republics. The only Muslim country in NATO. Our interests diverged in a very significant way. This is a good example of the complications of not just that part of the world but every part of the world. We’re going to have to be smarter in how we do things. The military can’t fix the problem. The problem in the Middle East can’t be fixed in the Middle East. The problems in the Middle East aren’t going to be fixed without the Russians. The Russians are there and they’re not going anywhere. That problem in the Middle East isn’t going to get fixed without the Iranians. We may not like either one of them and have major differences with both of them, but then the alternative is to just allow the continuation of the systematic destruction of the Middle East. That’s just wrong. You go across most of those countries in the Middle East and things get worse in Saudi Arabia. There’s a lot of internal conflict going on there. That isn’t getting better, I don’t think. GCC (Gulf Cooperation Countries) countries are threatened, very concerned about where does this put us. We’re going to have to think through some things a little differently. I think do some things differently our NATO allies are questioning in many ways our leadership in some of these areas. Afghanistan is another area. We are in our 16th year in Afghanistan and we’ve still got 8,500 troops there taking casualties there. That’s not getting better. Actually, the Taliban control more territory today in Afghanistan than they have in 15 years. We have NATO partners with us. We also have partners like Jordan in Afghanistan. How much longer their public are going to put up with their troops being in Afghanistan not seeing any kind of turn is an open question. Obviously North Korea, how do you deal with that continued complicated problem, especially now in light of the problem in South Korea. President Park will be soon to leave office. Our new administration transitioning in from the former administration is always a time of great danger and threat because of countries challenging us, taking advantage of that vacuum. You’re not going to fix any of those problems with the military. There is a military piece to it, but I go back to the two fundamentals that did more to help the world and help the United States. They were the defining platforms of the world order that was built after World War II that I was referencing. 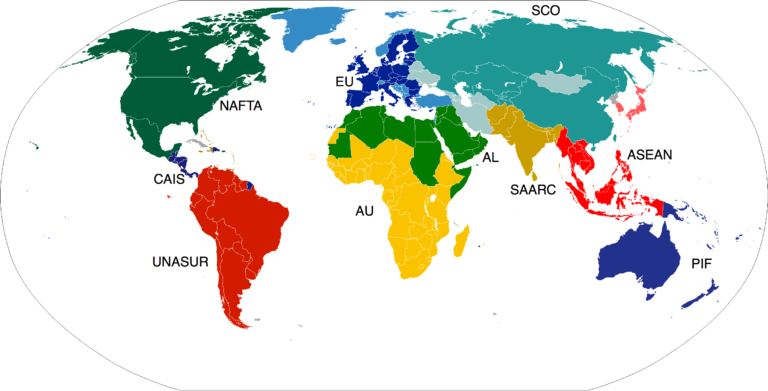 Alliances, strong common-interest alliances and trade. Now both can only do so much but without those you have no common-interest platforms to work together from. Middle East again. There will be no possibility, no hope for any kind of solution or resolution in the Middle East until there is some platform of stability that’s constructive to allow the next stage to start taking shape. We may see it differently at least in borders. The 1923 borders maybe changed once we see a cease-fire that everyone can agree to. When I say everyone, you’re still going to have terrorist groups that won’t agree. That’s not new. You’ve got to put that in perspective too. Terrorism. Terrorism is not new. The sophistication of terrorism and the empowerment of non-state activists is new because of technology and technology is driving as much of this as any one thing. It has now empowered groups. Social media for example. ISIS is as adept and sophisticated at using social media as any country. In fact, more so than most countries. Their equipment and techniques, strategies. You’re not going to undo that. Again, I go back to a comment I made early. We’ve got to get underneath this. Stability in the Middle East. That’s going to require enough of the powers there, the governments there. Certainly the Russians, certainly us. You can’t put NATO troops in the Middle East. I don’t think an American president anytime soon is going to put any kind of significant troop strength back in the Middle East. I remember my predecessor Bob Gates said a few years ago, “Anybody who again advises a president of the United States to put troops on the ground in the Middle East ought to have his head examined.” I fully subscribe to that. Fully subscribe to that. The answer to this is a, not just a continuation but a strengthening of alliances, of building new partnerships that aren’t necessarily based on a NATO-type alliance. Mutual security because there is no such thing as just straight military security as we think of security. The security of any nation rests upon the most fundamental of all securities and that’s economic security. A nation is only as powerful as its economy. It’s very simple. Your household. If you don’t have any income you probably don’t have any options. It’s the same thing about nations. Our economics, our diplomacy, our trade, our relationships, everything is now connected in the world fabric of security. That is security. Partnerships, new partnerships in Asia-Pacific. When I was Secretary of Defense, I took many Asia-Pacific trips, more than Secretary Kerry did. More than anybody in the administration. United States, in fact the entire Western Hemisphere, the western border of the Western Hemisphere from Canada all the way down to the tip of Chile, border the Pacific, so we’ve always been a Pacific partner. You know all the demographics and the economies and all the dynamics in play there. I focused on strengthening our alliances there, certainly military, certainly our more refined security interests. Also on new partnerships. I’ll give you an example. I was the first Secretary of Defense to invite all the ASEAN defense ministers to Hawaii for a conference. Never been done. Ten ASEAN ministers to a three-day conference. Half of those three days I put together an agenda having very little to do with military issues. I had the USAID director there. I had senior members from the Agriculture Department, the Commerce Department, Weather Bureau all there meeting with the ministers because I wanted to focus on where the common denominators are of people. Of people. Of your country, your people. How can you improve the lives of your people? Education, agriculture, everything. The rest of it flows from that. I think we actually did quite a bit of good from that. Then we had a day and a half of military and we showed off all our power. We didn’t have to do that. The ASEAN nations knew that. Give them a little inside sense of that. It’s going to be a balance. New partnerships, stronger enhanced relationships, alliances and trade. I mean, we couldn’t back away from trade if we wanted to. We are so connected to the world in every way and trade is not a guarantee. Never has been. Trade is an opportunity. Trade does so much more than just exchange goods and commerce. It opens doors that allow nations to respond to each other, understand each other, communicate with each other, connect with each other, coordinate with each other in ways that nothing else can. It opens everything up. It can’t do everything—you need all the other pieces of government as well—but those are fundamentals. Alliances and trade. Let’s go back to the Middle East here a moment. How does anyone believe that eventually the Middle East gets put back together? In the destruction of the Middle East and Syria, Syria is unique. It’s a destroyed country, the infrastructure, the housing. Good parts, major parts of Iraq, Libya, Danube, and it just continues to see more destruction, more destruction. What’s happening in Mosul? I mean it’s just how do you put that back together? It’s going to require immense, immense new building and economic efforts, trade to do that. What do you do with the people? People just can’t keep risking their lives going across the Mediterranean however they want to get to Europe. That, in itself, is starting to seriously fray the EU. That’s probably the jolting gong that led to the Brexit vote. The Syrian refugee issues. There were other issues too that were more basic and academic contributing to that. Brussels has become this empire of a parliament, a European parliament which is silly. People are fed up with it and I understand that. Why are we having to listen to what the people in Brussels have to say on … We are French, we’re Italian, we’re British, and so on and so on and so on. By the way, to say that just can be said about NATO. That they’ve been likened to these large model, this huge bureaucracy. Now that’s no reason to do away with them, but that’s part of what’s happened here too. We’re going to need the trade. We’re going to need the relationships to rebuild any part of the world. We don’t often think enough I think and the United States is guilty of this or thinking through these things. Certainly, if the United states military faces another military there is no country whether it’s partnered with Saddam Hussein or Muammar Gaddafi that’s going to stand a chance. No one can on a battlefield against the United States power. This ain’t going to happen because no one has that kind of power. Does that fix the problem? I think we learned a hard lesson in Iraq, we learned a hard lesson in Afghanistan. Unless there are functioning institutions of governments. This is the biggest problem I think there is in Afghanistan. Afghanistan has never had a central government. It’s never had functioning institutional bodies. It’s still a tribal country. That doesn’t mean they can’t have, won’t have, shouldn’t have. It’s up to them to have democracy but we can’t dictate that. The United States cannot dictate that. The Europeans cannot dictate that. We can help facilitate. We can help support but that’s beyond our capability to do that. We are surely not going to shock and awe countries into new democratic governments and new freedoms. Again we’ve learned some tough lessons the last 16 years and I think that was also part of what happened in this country in the election here this year. I end with this. Is this fixable? Is this doable? Do we have a future? Yes. Yes. Yes. We do. It’s really within our grasp. The Chinese aren’t going to dictate that. The Russians are not going to dictate that. We control our own destiny with our friends, with our allies. Boy, if there was a time you need friends and you need allies it sure as hell is now. It sure as hell is now. You don’t want to be pushed back. I used to be asked a question, “What’s it like to be the leader of the largest entity in the world?” The Defense Department is. Most complicated too. I said, I was Secretary of Defense but I never confused that with the reality. The Department of Defense consisted of empires within empires. You had to deal with all these different emperors at times. Once you start believing you’re running things, oh you’re in for a real shock. Chuck Hagel served as the 24th Secretary of Defense from February 2013 to February 2015. During his tenure, he directed significant steps to modernize America’s partnerships and alliances, advance the rebalance in Asia-Pacific, bolster support for European allies, and enhance defense cooperation in the Middle East while overseeing the end of America’s combat mission in Afghanistan. In addition, he led major initiatives for service members and their families, including increasing resources for suicide prevention, combating sexual assault, and accounting for missing personnel. He is the only Vietnam veteran and the first enlisted combat veteran to serve as Secretary of Defense.